OK, so something weird happened the other day. I cut my hair myself – I know that you know this… after all it’s obvious that I’m a self-cut man. Oh god, I don’t like the way this one’s going. So I had my clippers out and was using a recent copy of FT magazine to keep the shavings off my lovely carpet. Of course I was thinking about other stuff at the time – the price of lychees, how many beans make pi, when to book my next windsurfing lesson…etc. LOOK what happened! 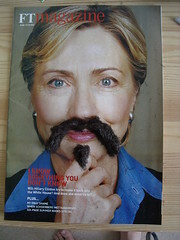 All the tiny hairs just automagically jumped into a pattern around Senator Clinton’s mouth, that if you look at it with your eyes all scrunchy makes it look like she has a moustache and a little goatee! Weird. And then the headline is “I know something you don’t know” – how’s that for a spooky double-entendre?